When you are learning English as a foreign language, it is important to understand the differences between British and American English. Mixing the two varieties will make your English sound strange and unnatural so it is best to choose just one and use it all the time. There is no “better” or “worse” variety of English and both British and American have their advantages depending on how and where you intend to use the language. For a complete word list with further explanations, click here. Another area of visible contrast is spelling. In 1828, Noah Webster published An American Dictionary of the English Language, in which the spelling of many words was simplified with the aim of making American English more logical in its reading and pronunciation. British English adopted Samuel Johnson’s Dictionary of the English Language of 1755 and thus retained many original spellings from words borrowed into the language. English contains a vast number of words of French origin, the spellings of which are often convoluted and contain additional (arguably superfluous) letters that are not pronounced. American tends to simply words of this kind, where British has left them unchanged. English slang is constantly changing and there are some interesting differences between British and American usage. Many Brits use “cool” terms they pick up from American films, adverts and popular music but Americans are less likely to have the same level of familiarity with British slang due to less exposure. Have you ever been to France? vs. Did you ever go to France? In British English collective nouns can often take either a singular or plural verb form depending on whether the speaker is emphasising the unified concept or breaking it down into individual elements. American English always follows such nouns with a singular verb form. For instance, in the British variety we can say: “My family IS big” (many relatives forming one large group) or “My family ARE big” (meaning your relatives need to get down the gym!). The second sentence would not be acceptable in American English. Other collective nouns that fall into this category are: government, class, staff, team, etc. Have you got a problem? vs. Do you have a problem? Have you got children? vs. Do you have children? British English is changing under influence from American so you may occasionally hear Brits using the second forms above rather than “have got”. However, Brits would not use American mixed forms like: “They’ve got a new house. They do?” (Brit. Have they?). Certain verbs are regular in British but irregular in American English, for example: dive/fit/wet. 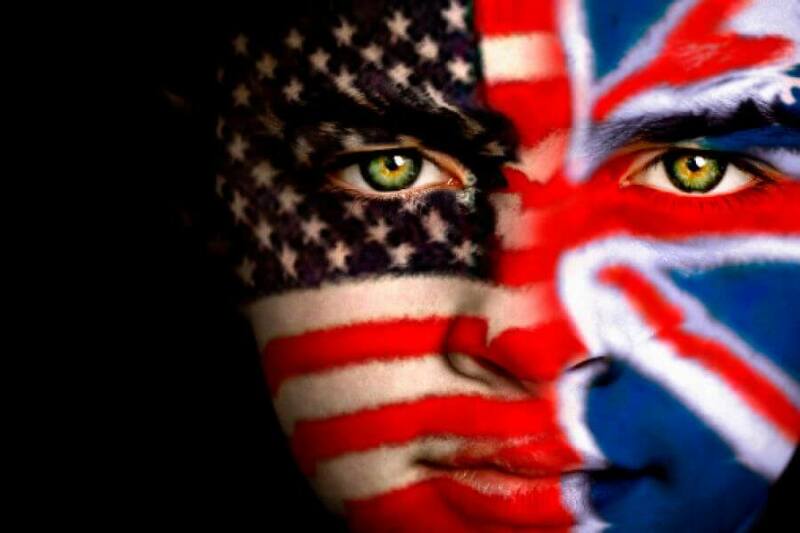 For a more detailed explanation of the grammatical differences between British and American English, click here. One of the mostly noticeable differences between British and American English is in pronunciation. Each language has its own standard form in addition to numerous regional accents. In England, the first divide is north-south (e.g. 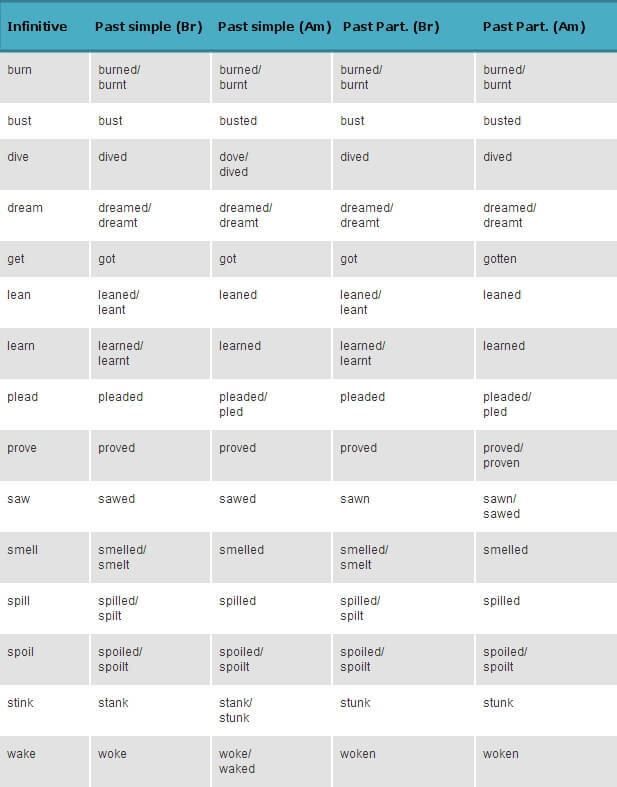 short vs. long vowels in words such as: bath, path, grass) and then between counties, cities and towns. A distance of a few miles can make a big difference when it comes to how people speak English. In America, there is a north-south and east-west divide and residents of New York, Huston and San Francisco may speak English quite differently. You can listen to some interesting examples of American accents here. Over the last few decades, British English has come under increasing influence from American English. This is because the majority of television programmes, films and music are exported to the UK from the States and people pick up words and expressions they are commonly exposed to, thus bringing them into general usage. Conservatives argue this is damaging British English, while liberals say it is a natural process of language evolution and change. Whichever side you are on, the fact remains that American is the dominant form of English in the world and has the greatest influence on its other varieties through the mass media and popular culture. To be fair, it’s not all one-way traffic and some British expressions have entered American English (among Britpop fans and certain social groups), but for those who are not so familiar with British English, here’s a funny guide.